The scoreboard industry is ever-changing, and technology has allowed LED scoreboards to support multiple sports in ways never before possible. But the traditional multisport scoreboards on the market today are either too generic or way too complicated for fans to make sense of the game information. Unlike fixed-digit multisport scoreboards, ScoreVision’s all-LED jumbotron displays customize the scoreboard layout to whatever sport is being played on the field or court with a tap of a button. ScoreVision displays automatically switch to a layout that is custom-designed for whichever sport you’re playing. Not only does the scoreboard present a view optimized for the sport, but that sport’s Scorekeeper App taps into logic that understands the game and your specific game rules, making the scorekeeping job incredibly intuitive and easy – simply launch the sport’s Scorekeeper App and play! ScoreVision currently supports a wide variety of indoor and outdoor sports with our suite of custom iPad and web-based apps. 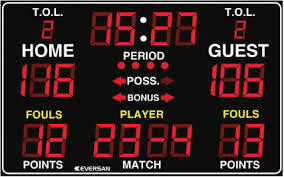 ScoreVision displays and scorekeeping apps make it easy to host basketball, volleyball, and wrestling in your gym. Check out the sport-specific layouts for indoor sports below! With more and more schools using their outdoor space for multiple sports on the same field, a ScoreVision system prevents you from having to rig a traditional scoreboard for a sport it doesn’t really support and is a smart alternative to purchasing additional scoreboards for each sport or dealing with the hassle of temporary scoreboards. ScoreVision displays are optimized for football, soccer, lacrosse, rugby, and more on your field. Check out the custom layouts for these sports below. In addition to effortlessly supporting all the sports you host, all ScoreVision scoreboard layouts incorporate automatic digital ad sequencing, delivering value to your sponsors without burdening your scorekeeper. Plus, the displays support more than just athletic events. ScoreVision displays can be used for a wide variety of alternative uses, like movie nights, marching band competitions, pep rallies, and so much more! Interested in learning more? Check out last week’s blog post on how Oakland University is using their new ScoreVision jumbotron system for basketball and volleyball and stay tuned for next week’s testimonial from a ScoreVision high school! Follow us on Twitter and Facebook to be the first to know when it’s released. To learn how you can bring ScoreVision to your school or facility, contact us today!